Find out how you can optimize your work management and boost your productivity. Every project, no matter how complex, can be broken down to one basic element: a task. That said, it lies in the nature of projects to entail more than only one task. Some of them might even be connected through dependencies and need to be completed within a team. Especially when levels of complexity are added to the tasks, a task management software can help you coordinate and track team tasks, and keep an overview of the project schedule. In a very general approach, task management begins with compiling a to-do list that includes the different things you want to accomplish. One of the commodities we need most but never seem to have is time. Making effective task management an important factor in completing all the things we need or want to achieve. Effective task management can help both individuals and teams achieve objectives; especially groups and teams benefit from a strong task management system by facilitating team collaboration and sharing information for the successful accomplishment of collective goals. Your work efficiency often depends on your ability to make productive decisions quickly and asking effective, time-saving questions in meetings. One way to increase your efficiency is having a list of things to do during your work day. Even better, you can show the relative importance of every task if putting them in a prioritized order. You can for example prioritize them in order of their due dates, making sure you don't overrun deadlines. Another aspect to keep in mind are task dependencies, some of the tasks on your list might build on the completion of a previous task. A task management software can help you to manage all aspects of a task from scheduling, assigning financial and human resources to reporting of the task status with only one simple tool. Depending on the complexity of each task, it might be useful to define in-between statuses reflecting the relative completion of each tasks. Especially when managing team tasks, it is helpful to know whether the task has already been assigned to a human resource. 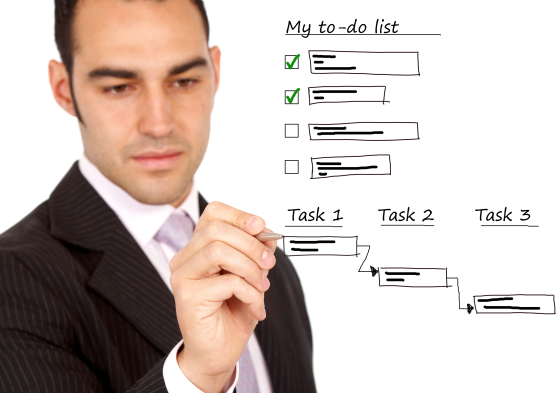 This way of creating responsibilities is also beneficial from a project management standpoint. Team members know exactly what to do and they hold each other accountable for the task completion. Keeping track of a task's status is essential for efficient task management because it helps you to stay on track with your project schedule and progress. As banal as task management may seem, it can easily reach a level of complexity that asks for a task management software to ensure efficient and effective task management. With several people working on one project with a multitude of tasks to accomplish, it is key not to get lost in a tool chaos. A task management software helps keeping everyone involved on the same page, providing all the information they need to effectively work towards the project goals. One of the greatest benefits of using a task management software is that it can serve as an early warning system. notifying you about deadlines that are being overrun and also making sure that the tasks are being distributed evenly across the available human resouces. Kanban is one of the many methods you can use for task management and scheduling. It is firmly rooted in the field of software development but experiences increasing popularity across a wide spectrum of business industries and disciplines. Kanban task management emphasizes the just-in-time delivery of results while not overloading the individual team member. The idea behind this task management system is that every team member has access to a pool of open tasks that have not been assigned to a human resource through the project management, yet. Whenever team members have completed a task, they refer to the task backlog and pro-actively assign themselves to the next task. The task's status then switches to "in progress" until the team member marks it as completed. This procedure continues until all the tasks from the backlog are completed. Most frequently, kanban task management is visualized with index cards that combine information on the what the task entails, who's in charge of it and what the due date is. In more sophisticated task management systems, it allows the team members to comment on the task, give feedback to their supervisors and share information with other team members. InLoox offers you a task manager that adjust to your specific needs and adopts to the level of complexity of your tasks and projects. With our task management tool you can compile a to-do list that helps you get organized in a few simple steps. If your projects increase in complexity or you need to manage team tasks, InLoox PM offers you a centralized task management platform, ensuring that everyone involved has access to the most up-to-date information. With the InLoox task manager feature you can schedule work packages or leave it to the individual team member to set a due date for the tasks they have been assigned to and thereby boosting their motivation. Thanks to the conventient visualization of the tasks' status task tracking has never been easier. Whether you and your team prefer working with classic project management methods or you feel most at home in the realm of agile project management, InLoox provides you with the task management tool that fit best your needs. Find out more about our task management feature here. InLoox PM provides highly effective support for everyday standard business processes with time, resource and project task management. Task Management & Project Time Management - InLoox PM • Copyright 1999-2019 © InLoox, Inc. All rights reserved.